Brexit – the withdrawal of the United Kingdom from the European Union, following a referendum held on 23 June 2016 where the majority supported leaving the EU. The invocation of Article 50 started a two year process due to conclude with the exit on 29 March 2019. 29 March 2019, the day democracy dies is the day that by invoking Article 50 the United Kingdom should be leaving the European Union as voted for by the majority of the electorate. But no, those worthless b*stards in Westminster decided to try and overrule the outcome of the referendum because it doesn’t fit with their own personal agendas. Hard or soft exit, either way those worthless b*stards have had two whole years to sort out the exit arrangements but they haven’t because ‘they’ don’t want to. As for the Brexit financial settlement (‘divorce bill’) it’s time the EU gravy train was derailed and for those with their nose in the trough to get a job contributing to the economy not profiteering from it. As MPs voting behaviour on Brexit options shows, they’re representing themselves rather than the electorate, if those worthless b*stards think I’m going to vote for any of them in the upcoming local elections, they’re wrong, a protest vote isn’t necessarily a wasted vote. 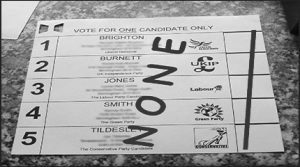 What if the majority of the electorate were to write NONE across the ballot paper, and put a single line through all the boxes, would they get the message?.